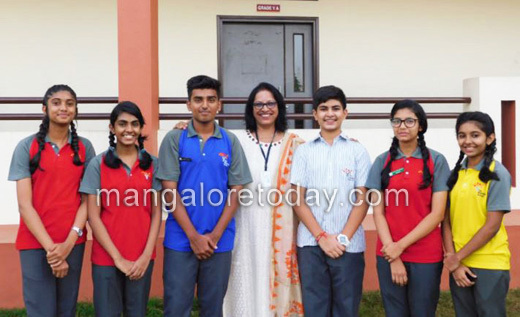 Mangaluru, Aug 09, 2017 : A team of six students and a mentor from The Yenepoya School, Jeppina Mogaru, Mangaluru has been selected for participating in the upcoming IIMUN (Indian International Model United Nations) USA 2017 Conference. Shoaib Shiek Mohammed of Grade 10th, Anjali Maria Augustine, Caroline Castelino, Dhruv K.Shah of Grade 9th and Ilhan Irfan, Vaishnavi Rao of Grade 8th are the students who are participating in the conference. They will be accompanied by Mrs Mercy Rego, their teacher and mentor. The conference will see the participation of students from various parts of India and will be organized inside the United Nations Headquarters at New York during the month of August. The itinerary of the students includes three days of MUN conference and an educational trip in the USA where they will be visiting New York, Washington D. C. and Orlando. The students will discuss various international affairs and issues and provide novel solutions for them. It is a platform for the children to debate on issues of social and economic importance andreach out for solutions.